In this video I will finish the Android Contact App I started in the last video. The goal of this tutorial is to keep everything simple, but to teach numerous things. I’ll show you how to create lists of contacts, which will contain a list of information on each contact. Will save these contacts to a database online. We’ll also be able to edit it from multiple screens. After this video you’ll be able to create lists of contacts, edit contacts and delete them, with everything stored online. First of all I will thank you for giving such a knowledge full tutorials. I have watched few of the videos and learnt a lot. Now I am trying to create an app and I need to form a TLS connection between my app and server. I will be very much thankful to you if you could provide a tutorial on forming a TLS connection between android app and server. You’re very welcome 🙂 I’m actually having some trouble setting up an SSL connection using AI. I’ll post a fix if I figure it out. I’ll be making a few more AI tutorials on canvas and animation very soon. I would immensely appreciate if you can give me a pointer on how to create what I consider a basic app for my ESL students. The app would be a flashcard that would contain 20-30 words with their correspondent meaning and sound. Thank you Derek, I would like to know if we can add TableRows or Horizontal layout automatically based on a logic ? 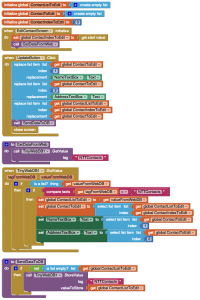 As you done using the Code, Can we do it using the AppInventor ? 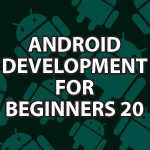 Are you planing to continue with tutorials for app Inventor or this is the last one?? Yes I will make a few more on animation and canvas. They will come out right after I finish the last Git tutorial. Sorry about the wait. I recently finished this app as described in the video, but I am getting some errors! If I then push Update Contact, it throws the error, “Replace list item: Attempt to replace item number 1 of a list of length 0: ()”. When I pull up my tinywebdb interface on the web, there are definitely items in the list. Any insight would be appreciated! It is throwing that error because you are trying to replace something when the list is empty. Try importing the package I provide and the errors will go away.